경제적이면서도 고온에서 정확한 온도측정이 가능한 써모커플! *써모커플 캘리브레이션 타입 별 최대 온도와 함께 확인하셔야 합니다. A grounded junction thermocouple with the Inconel overbraid welded to form a smooth rounded tip for all general purpose applications. A general purpose, bead welded, exposed junction thermocouple. 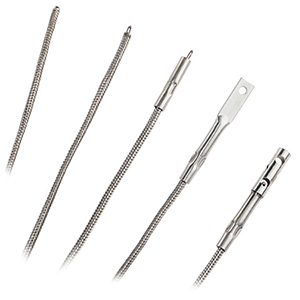 An exposed junction, bead welded junction thermocouple with an Inconel collar to clamp the probe to a surface, or to secure it into a hole or any fabrication. Grounded junction. It can be bolted to a surface, or the Inconel eye can hook the thermocouple to a conveyor flight. Ungrounded junction versions are available. Contact sales for more information. Has an Inconel air hood to protect the beaded wire exposed junction. This design can be clamped to a surface, hooked to a conveyor flight, or bolted to a surface by using the through hole at the open end of the hood. ** 피트 단위로 길이를 확인하세요. 3' 또는 10' 이 기본 사양 입니다. -제품 번호에 “ CAL-” 을 추가하시면 캘리브레이션 인증서를 받으실 수 있습니다. 영업부와 상담하세요. -실리카(이산화규소) 절연처리 옵션으로 주문하실 수 있습니다. 제품번호를 XCIB에서 XSIB로 변경하시면 됩니다. 참고: 직선형 M8 수형 플러그의 경우, 추가 비용으로 모델 번호에 "M8-S-M"를 추가하고, 직선형 M12 수형 플러그의 경우 추가 비용으로 모델 번호에 "M12-S-M"를 추가하세요. 직각 M8 수형 플러그의 경우, 추가 비용으로 모델 번호에 "M8-R-M"를 추가하고, 직각 M12 수형 플러그의 경우 추가 비용으로 모델 번호에 "M12-R-M"를 추가하세요.